On the 10th anniversary of Media Archeology Festival, Aurora Picture Show presents three nights of performances that broaden the horizon of moving image art in Houston, Texas. Titled Media Archeology: In the Beginning, this year's festival will feature experiential moving image art and performance that look to the deep time of pre-history to create compelling experiences of how the world was formed and how the world of our ideas is shaped. Curated by Steve Dietz of Northern Lights.mn, Media Archeology programming kicked off on April 9th with the performance by Miwa Matreyek presented in partnership with CounterCurrent 2014. The festival continues from Thursday, May 15th to Saturday, May 17th when Aurora will showcase the works of Australian artist Lynette Wallworth and Minneapolis artist Piotr Szykalski for one-of-a-kind cinematic experiences. 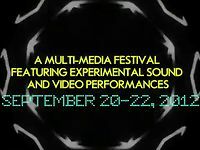 Founded in 2003, the Media Archeology Festival was created by Aurora Founder Andrea Grover and has included artists such as Luke Savisky, Negativland, Eddo Stern, Joshua Light Show and Brent Green. This annual festival, which originally focused on highlighting artists and collectors who preserve, study, and/or re-use found media has now be expanded to include live cinema performances and new media works that connect the past to the present, analogue to digital. On May 6th, Aurora Picture Show members will be invited to take a stroll through the 10 year history of the festival for Media Archeology Then & Now. This happy hour screening and talk will be presented to Aurora members showcasing the works of past artists and discussing the history of the festival. For 2014, Aurora has engaged a new media and public art expert, Steve Dietz, to curate the festival. He is the Founder, President, and Artistic Director of Northern Lights.mn, an organization that presents innovative art in the public sphere, both physical and virtual, focusing on artists creatively using technology. The selection of Dietz reflects the changing nature of our art form and Aurora's ongoing commitment to expand the genre of moving image art. About Media Archeology Curator Steve Dietz writes, "Media Archeology: In the Beginning presents the work of three artists who use contemporary technology, two of them with live performance, to evoke both ancient media as well as the conundrum of non-mediatized history." Animator/performance artist Miwa Matreyek kicked off Media Archeology on April 9th with her live media performances Myth and Infrastructure, as well as, This World Made Itself. The works of Miwa Matreyek spin dreamlike narratives by fusing intricate animations into live performance creating spellbinding visuals. Blurring the line between real and unreal, Matreyek's performances are a magical cinematic experience. On Thursday, May 15 in partnership with the Houston Museum of Natural Science, Aurora will host a screening by Lynette Wallworth titled, Coral: Rekindling Venus. This extraordinary moving image journey that will be projected onto the planetarium digital dome ceiling. Featuring mysterious realm of fluorescent coral reefs, bioluminescent sea creatures and rare marine life, this cinematic experience reveals a complex community living in the oceans. The Los Angeles Times declared: "As close as most of us are going to get to feeling like we're in a James Cameron submersible, Coral is immersive cinema at its most spectacular." After the film played in the American Museum of Natural History, the Huffington Post reported: "Audible gasps filled the room, audience members clasped their hands to their chests and a few left the planetarium in tears. Through imagery and music, Wallworth offered audience members an opportunity to gain a personal connection to our oceans." Then on Friday, May 16, Piotr Szyhalksi will present a live multi-media performance titled Elemental. Part of his series of experimental performative projects exploring new approaches to sound and media hybridity, the performance will be from 6-9PM. Then the following night, the audience will be invited to join Aurora for a reception and artist talk where the resulting installed art exhibition will be on display. Audiences are encouraged to attend both nights to see the art as it exists in two forms: as a performance and the resulting remnants that create an installation. Saturday's Closing Reception is courtesy of Phoenicia Specialty Foods and Saint Arnold Brewery. Animator/performance artist Miwa Matreyek returned to Houston for an evening of live cinema performance in partnership with Aurora Picture Show for Media Archeology and the University of Houston Cynthia Woods Mitchell Center for the Arts for CounterCurrent 2014. Incorporating the live silhouette of her own body into video projections, Matreyek renders exquisite animations into breathtakingly beautiful theatrical presentations. Matreyek presented Myth and Infrastructure, as well as, This World Made Itself. This performance took place on Wednesday, April 9th. As part of the benefit to becoming an Aurora Picture Show member, Aurora hosts members-only events throughout the year. For Media Archeology Then & Now, members are invited to join us for a casual evening of conversation and looking at examples of work from past Media Archeology festivals. Media Archeology, now in its tenth year, has featured a wide array of established filmmakers artists and curators. The first year of Media Archeology was focused on 16mm collections by film aficionados such as Rick Prelinger of Prelinger Archives and Skip Elsheimer of AV Geeks. Over the years it evolved into a festival of live cinema performance with artists such as Tara Mateik, Brent Green and Luke Savisky. Advance RSVPs are kindly requested. If not already a member, individuals are encouraged to join online or at the door. Created and directed by Australian media artist Lynette Wallworth, Coral: Rekindling Venus is an immersive film experience that takes viewers underwater through the mysterious realm of fluorescent coral reefs in Australia, Papua New Guinea and Indonesia. Wallworth's visually stunning Coral: Rekindling Venus is a full-dome film presentation designed to immerse viewers in the complex world of rare marine life with the hope of creating an emotional connection between a global audience and the planet's endangered coral reefs. This epic project features original deep-sea photography from Emmy Award-winning cinematographer David Hannan, and music by Antony and the Johnsons, renowned Australian Indigenous artist Gurumul and German composer Max Richter. Elemental is part of a series of experimental performative projects exploring new approaches to sound and media hybridity. This two-night show will feature an evening of multi-media performance that will result in an installed art exhibition on display the following night. Szyhalski explores the fundamental concepts defining sound through electricity by investigating the relationship between the most rudimentary electronic sounds and other conceptual frameworks that can be defined as "elemental" such as foundational components of language, prehistoric social structures. Elemental unfolds from the intersections of visual, audio and performative media into the oldest existing traces of human music making, as a way of understanding the roots of harmony and structure in sound. The resulting work draws a connection between "foundational" sounds from deep history, and contemporary sound building blocks generated by rudimentary electronic systems. Audiences are encouraged to attend both nights to see the art as it exists in two forms: as a performance and the resulting remnants that create an installation.